At W Hotels, PAW means you can travel in luxury, best friend in tow. 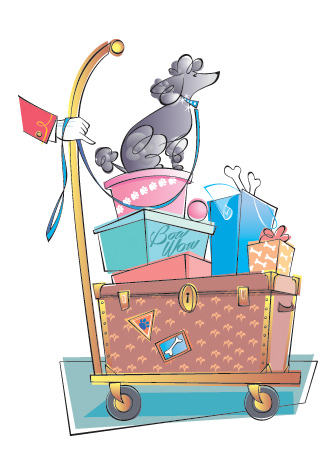 As “Le dernier cri” in hospitality, when the two of you check in, W gives your companion a pet toy, pet treat, W Hotels pet tag, cleanup bags, special hotel services, custom W pet bed, food and water bowls, and special pet treat at turndown. Hungry for more? Concierge can arrange for a pet sitter, dog walker, vet, groomer, birthday cake, leashes, extra toys/food/treats, supplies (e.g., collar, litter box). You name it. They’ll also happily point you in the direction of neighboring pet-friendly businesses, stores, parks, and more. In other words, one BIG bone-anza. The cat’s meow, you lucky dog!